MOSCOW, November 2 (RIA Novosti) ­ Moscow city officials plan to target tourists and English-speaking residents in a whole new way: with a new English-language radio station. Moscow FM, which will be hosted on the 105.2 frequency, is expected to hit the airwaves on November 12, the Kommersant daily newspaper reported Friday. Igor Shestakov, chief editor of the Moscow Media group, which owns Moscow FM, told the paper his company acquired broadcasting rights last month and plans to host content from state-owned international news channel Russia Today. 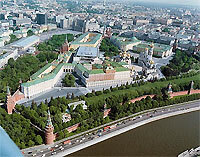 The Moscow city government purchased the frequency from a private owner in July, the paper reported. The station’s broadcasts will target tourists and expatriates, while also catering to Russian residents learning English, Shestakov said. The station, “a fundamentally new urban radio,” according to Moscow Media’s website, will report both international news and local news of interest to Moscow residents. English-language media in the Russian capital is largely limited to a handful of newspapers and magazines, including The Moscow Times and The Moscow News (which is owned by RIA Novosti). A large portion of the estimated 150,000 expatriates, particularly from the United States and Europe, that work in Russia live in Moscow. Meanwhile, an estimated 5 million visitors arrive in the capital every year. The Moscow Media group also owns the Moscow 24 television channel, as well as the m24.ru online information portal and Moscow Speaks radio station.